Early in the spring male vipers creep from their winter home in the peat to the first rays of sun to mature their sperm. In this period they do not eat. However, they will molt and look for female willing to mate. They are very mobile in this period and traverse the habitat seeking smell traces of females. If two males come together, then usually follows a spectacular snake dance. So this by hormones driven machos determine who gets mated to the often in close proximity reclining female adder. Males focus on and twist themselves around each other. They try to press each other to the ground and keep their heads higher than their rivals. Older males are thus at an advantage because they are bigger. 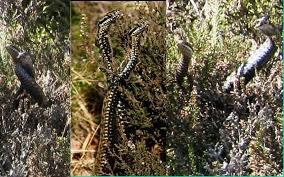 Although the adder has an impressive poison apparatus, he never uses it during the adder dance. The loser will lose his right to mate, but not his life. During the dance the snakes seem to lose their usual shyness. The rivals are so immersed in their fight that spectators are ignored completely by the adder men.